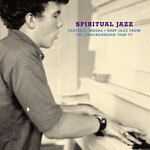 Now-Again Records, in conjunction with Jazzman Records, presents ''Spiritual Jazz: Esoteric, modal and deep jazz from the undergound, 1968-77'', an expanded version of the compilation that introduced many listeners to the sound of the unsung musicians who, in the midst of the Vietnam War and the fallout of the Civil Rights struggle, created some of the most beautiful spiritual and meditative music of the era. The music was at times funky, at times contemplative, but it always strived to say something about the world in which the musicians lived. This is jazz created in the era after John Coltrane, a time which saw the evolution of an underground jazz that spoke about the reform of the soul, the reform of the spirit, and the reform of society: a music which was local and international at once, which was a personal journey and a political statement, and which was religious and secular in one non-contradictory breath. It includes music by acknowledged masters, and moments of brilliance by unsung figures known to us from just one or two recordings. There are songs from prison bands, Egyptian big bands, high school jazz ensembles, African musicians gigging with free jazz legends, and African American jazz heroes.